Genelec, provider of active monitoring technology for more than 35 years, is launching its new 1234 Smart Active Monitoring (SAM) System. Designed to achieve accurate and powerful sound reproduction in demanding recording and mixing environments, the 1234 SAM System provides excellent, well-controlled directivity and neutral sound reproduction. Supplied complete with a RAM XL (Remote Amplifier Module), this solution is among the best in modern, high-performance, large-main monitoring systems. 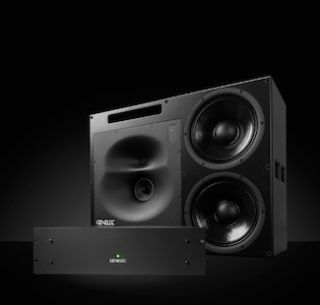 The Genelec 1234 SAM System packs cutting-edge specification and intelligent technology into a powerful main monitoring solution.The Genelec 1234 SAM System packs cutting-edge specification and intelligent technology into a powerful main monitoring solution. All electronics, amplifier circuitry, drivers and enclosures are designed, assembled, tested, and individually calibrated at the Genelec factory in Finland. The 1234 SAM System has a system frequency response from 29 Hz to 21 kHz and is capable of delivering 125 dB SPL at 1 meter through a combination of efficient Class D amplifiers providing 2 x 750 W, 400 W, and 250 W of short-term power for the woofers, midrange, and tweeter channels, respectively. It is ideally suited for recording studios, post-production houses, digital mastering facilities, radio, and TV broadcasting. The system’s 160-liter enclosure features two 12-inch drivers and a Genelec proprietary five-inch midrange driver, as well as a one-inch treble driver mounted in a large Directivity Control Waveguide (DCW). With Genelec’s advanced DCW providing a wide and controlled listening area, early reflections are minimized for very accurate sound reproduction both on- and off-axis. The dual-woofer design extends the control of the directivity to low frequencies along the short front baffle dimension, and the Intelligent Signal Sensing (ISS) circuitry saves energy by automatically putting the monitor to sleep when the audio signal has been absent for a period of time.